Based on her recent testimony to the U.S. Congress, Federal Reserve Chairperson Janet Yellen is still rather optimistic on the U.S. economy, but what do the most recent data imply? Is the Fed still on track for a rate hike? And how could it affect the forex market? Well, time to look at the data and find out. The final reading for Q1 2015 GDP showed that the U.S. economic contraction was revised upwards from -0.7% to -0.2%, but it’s still a far cry from last quarter’s 2.2% GDP growth. As to why the economy contracted , the U.S. Bureau of Economic Analysis cites a 5.9% decrease in exports (+4.5% previous), a 2.0% decrease in fixed investments (+4.7% previous), and a 1.0% decrease in government spending (+1.6 previous) as the primary factors. Clearly, declining exports was the main headwind to GDP growth, but the Federal Reserve, via the latest FOMC meeting minutes, stated that “net exports might be a considerably smaller drag on GDP growth in the second quarter of the year.” Hmm. I don’t know about that. The trade deficit for April was $40.9 billion, with exports decreasing by 2.3% year-on-year while imports decreased 1.8% year-on-year. The trade deficit for May isn’t any better since it slightly went up to $41.9 billion, with exports decreasing by 2.7% year-on-year and imports by 2.2% year-on-year. The latest employment data shows that non-farm payrolls failed to meet expectations with only 223K new jobs (231K expected, 254K previous). It gets even worse because forex traders had high hopes due to the ADP report being better than expected at 237K (219K expected, 203k previous). Average hourly earnings was also a disappointment since it remained flat and the previous reading was even downgraded from an increase of 0.3% to only 0.2%. While the jobless rate ticked down to 5.3% from 5.5%, it wasn’t all good because a closer look at the report shows that a whopping 640K Americans left the labor force in June. 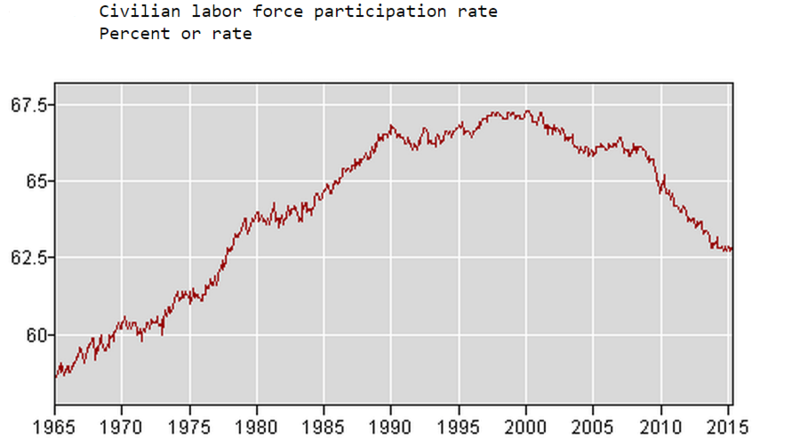 This explains why the labor force participation rate also ticked down from 62.9% to 62.6%, a 38-year low. Yup, you read that right. Can’t be good, huh? Still, some analysts argue that the Fed remains on track for a rate hike since this is the 57th consecutive month of jobs gains, and wage growth isn’t really a prerequisite for a rate hike anyway. Many FOMC meeting participants were anticipating a solid pace for consumer spending, so it’s doubly disappointing when headline retail sales declined by 0.3% and the previous reading was downgraded to 1.0% from 1.2%. Core retail sales also dipped into negative territory at -0.1% and its previous reading was also downgraded from 1.0% to 0.8%. Interestingly enough, the final readings for the University of Michigan’s June consumer surveys were still pretty upbeat: consumer sentiment went up to 96.1 from 90.7 in May; current economic conditions jumped from 100.8 back in May to 108.9; and the consumer expectations index climbed higher from 84.2 to 87.8. 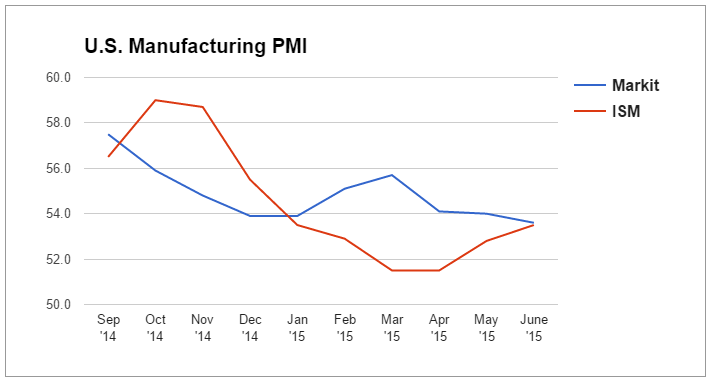 Markit’s manufacturing PMI reading for June saw a decline from 54.0 to 53.6 while the Institute for Supply Management’s (ISM) manufacturing PMI for June went higher from 52.8 to 53.5. They’re still both above the 50.0 mark, so they both agree that the manufacturing sector is still expanding and business conditions are improving, although the ISM is saying that the expansion is picking up while Markit is saying that it is slowing down. 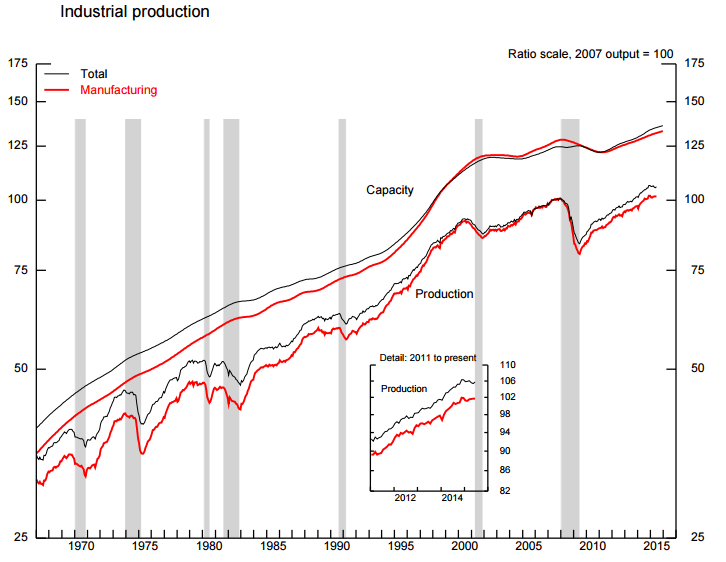 Data released by the Federal Reserve also shows that total industrial production increased by 0.3% in June (-0.2% previous) but fell by 1.4% on a year-on-year basis. A closer look at the components of the report shows that manufacturing production slowed down a bit to 1.8% (2.1% previous) due to lower overseas demand and a stronger Greenback, so Markit’s manufacturing PMI reading seems to be more accurate this time around. Headline CPI increased by 0.3% in June, slightly slower than May’s 0.4% increase. 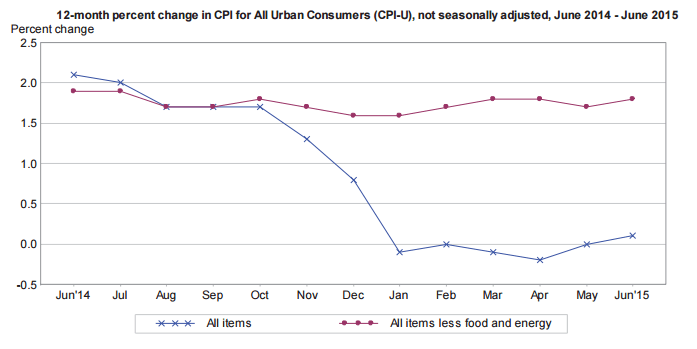 As for core CPI, it went up by 0.2%, faster than last month’s 0.1% reading. On a yearly basis, headline CPI increased by 0.1%, which is the first increase in six months and therefore very good news. It’s still far, far away from the Fed’s 2.0% inflation target, though. The headline PCE price index for May also increased 0.3%, better than April’s increase of less than 0.1% while the core PCE price index increased by 0.1% in May, the same increase as in April. Overall, the recent figures aren’t exactly optimistic. GDP growth, employment, and consumer spending, in particular, were rather disappointing, but the data aren’t really dismal either. It also still remains to be seen whether the current slew of poor data is just a hiccup or the start of a downhill ride. Looking forward, Yellen stated in her July 15 testimony before Congress that “prospects are favorable for further improvement in the U.S. labor market and the economy more broadly.” Maybe she’s right since inflation, for one, is already promising. So what do all these mean to forex traders like you and me? Well, long to medium term demand for the Greenback is expected to remain steady since the U.S. economy is still doing much better compared to most of its peers. Besides, several Fed officials keep hinting that they’re likely to hike rates before the year ends. And as long as new reports don’t shatter this belief, we can expect sustained demand for the U.S. dollar.